The goal is simple when you are the defending state champion: Do it again. A previous title also makes for a popular team. 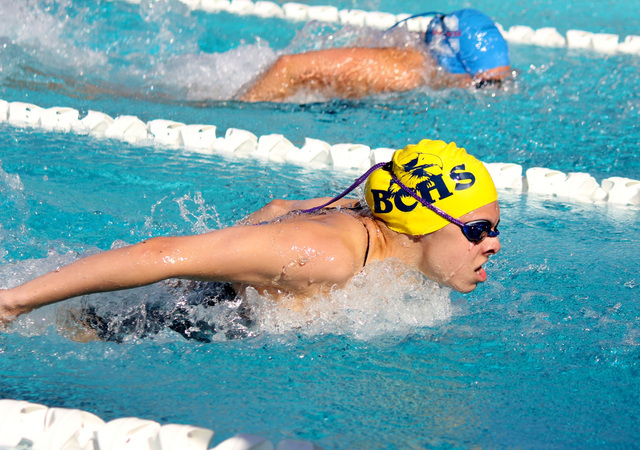 Almost 50 swimmers have tried out this spring for Boulder City High’s two swimming teams. The Boulder City boys are aiming for their fifth consecutive state title; the girls are seeking their third in a row. “We hope to repeat last year’s state and regional championships for the boys and girls,” said coach Sara Carroll, who is entering her 22nd season. “Who knows what to expect from the newcomers. Nearly 50 have signed up for this season. The first few weeks are a bit rough due to the wide range of abilities, but I am excited about all the participation. Seniors Sam Sauerbrei and Jason Lyon will lead the boys team with junior Nick Lara. Sauerbrei finished second in two events at the 2014 state meet. He excels at the 200 butterfly, and 200 and 400 individual medley. Lyon was fourth in two events and Lara was fifth in two events. Other top swimmers include Braden Klouse and Cade Braden. The girls team returns 10 letter winners, led by sophomores Abby Sauerbrei and Montana Lloyd and seniors Alex Hubel, Jessica Purdy and Mandy Gebhart. Others who could provide key performances in several events are Becca Lelles, McKenzie Cummings, Aubrey Klouse and Sarah Estes. Each swims a variety of events plus relays for the Lady Eagles. Hubel won both the 50-yard and 100-yard freestyle at last year’s state meet; Lloyd won the 100-yard backstroke. Purdy and Gebhart each finished second in two events in the state meet and Sauerbrei had two third-place finishes.